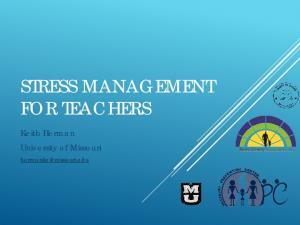 Introduction W elcome to the Stress Management Journal. As you flip through the pages of this workbook you may be asking yourself: “Why would I want to keep a diary of my stress?” We’ll answer that question in a moment. But first let us pose another question: “Have you ever asked your doctor about stress?” If you did, he or she probably didn’t have much to say. That’s because a diagnosis of stress is difficult to make. It takes a lot of time. To speed things up a bit your doctor might prescribe something to mask your stress symptoms without ever finding out what might be causing you to feel this way. You take this prescription despite the undesirable sideeffects, thinking it is a cure for your condition when really it is just a cover-up. This is roughly the equivalent of an auto mechanic suggesting you put masking tape over a flashing warning light on the dashboard of your car. The warning light is not the problem. It is only an indication of a problem which needs to be addressed internally. Every day millions of people take over-the-counter and prescription drugs thinking they are a cure for their stress-related symptoms when in fact, these medicines usually don’t address the source of the problem at all. But you can take the time your doctor doesn’t have and get to the root of your stressrelated symptoms by doing some of the research and observations yourself. That’s why you want to keep a diary of your stress. Once you start this process you’ll begin to see the connections between your stress symptoms and the source of your stress: When you come down with a cold before a major presentation you’ll make the connection in your journal. When you experience an allergic reaction to something that’s never bothered you before, you may see a connection to your levels of stress in the journal. When your belly aches every Friday before the weekly sales meeting, you’ll make that connection too. 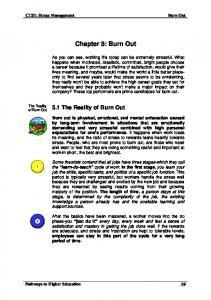 The journal helps you look for underlying causes of stress. Once you uncover the obvious sources of your stress, the journal encourages you to look deeper for underlying sources of stress like time pressure, financial pressure and relationship problems. Most people blame their stress on an assortment of superficial hassles including traffic jams, long lines, bad bosses, slow drivers, and computers that crash. But with the help of the journal you may see that much of your stress is really the result of a single underlying problem like time pressure. (And one problem is usually easier to solve than five!) The journal also helps you manage stress by introducing you to five relaxation techniques such as deep breathing and progressive muscle relaxation. In addition, the journal introduces you to five cognitive techniques that will change the way you think about stress. These techniques include: changing your negative self-talk, taking control and keeping your stress in perspective. Don’t let your stress go unchecked. Most people never stop to consider their own level of stress. They let it run their lives, affect their relationships and damage their careers. They never stop to figure out the correlation between their stress disorders and their sources of stress. Left unchecked, these stress-related problems eat away at your happiness and your health and can eventually lead to a life-threatening disease. 90% of all visits to primary-care physicians are for stress-related problems. Researchers estimate that 90% of all visits to primary-care physicians are for problems that are related to stress. Migraine headaches, immune system disorders, high blood pressure, high cholesterol, heart disease and possibly even cancer are all diseases or conditions that can be adversely affected (and in some cases caused) by stress. Think about that word disease for a moment. Break it down into two syllables (DIS-EASE). It’s a synonym for the word stress. So isn’t it worth spending a few minutes a day observing and writing down your stress-related symptoms if it will help you feel more at ease now and prevent possible disease in the future? Remember, some sources of stress you can control and some you can’t. So you’ll never eliminate it entirely. But during the next 28 days we’ll focus on the kinds of stress you can control and show you how to eliminate it, avoid it, and cope with it so you feel happier, healthier and more relaxed. Ready to Start? You need to keep track of your stress as it happens. In order to do this, you can either carry the stress journal with you or you can carry a small spiral-bound pad, a day planner or a 3x5 card and jot down a few quick notes whenever something stressful happens. * At the end of the day you can transfer these notes to your journal and expand on them while the events are still fresh in your mind. Don’t wait until the following day as your memory of these events will fade quickly. In order to make the connections between stress sources and symptoms you need to do your journaling every day. There is a little box at the bottom of each page called Stress Hits. This is a place to use tally marks to keep track of every little moment when you feel the least bit uncomfortable. On day 15 this box changes to Uplifts. Instead of tracking all the little things that get you down, now you’ll be tracking the little things that perk you up. We suggest you start Day 1 on a Monday. (Days 6-7, 13-14 etc., require you to reflect on the week that’s just past and are best kept on the weekends.) * See the back of this booklet for portable journal pages. DAY 1 Today you are going to jot down the events and circumstances that cause you to feel stressed. An interaction between you and your environment that causes you to feel uncomfortable in any way. Examples: 8:45 AM I felt stressed when I couldn’t find my car keys. 2:20 PM I felt stressed when I had to deal with an angry customer. 5:30 PM I felt stressed when I got stuck in rush hour traffic. DAY 2 Today you are going to jot down any distressful emotions you experience from the adjacent list. 8:15 AM I felt annoyed when the kids dawdled over breakfast. 1:20 PM I felt frustrated when my computer didn’t work right. 5:10 PM I felt angry when my boss asked me to work late. DAY 3 Today you are going to jot down any stressful behaviors you engage in from the adjacent list. You may also wish to keep track of your stressful emotions (see previous page). Examples: 9:15 AM I was late for work the third time this week. 1:20 PM I argued with a co-worker over nothing. 8:10 PM I felt so stressed out I drank three glasses of wine to calm down. DAY 4 Today you are going to jot down any stress symptoms you experience from this list and try to connect them with the stressful events that preceded them. 9:05 AM I could feel the tension in my shoulders as my boss approached. 3:00 PM I get a headache every afternoon when it’s hectic. 11:59 PM I couldn’t get to sleep thinking about the day’s events. *Watch out for secondary stress reactions: Stress can cause any one of the reactions from the above list, but sometimes you react to your reactions thus increasing your anxiety, insomnia, nervous stomach or whatever it is you might be feeling at the time. Let’s say you notice a racing heart. (Usually a minor stress symptom.) If this causes you to believe you’re having a heart attack, you might begin to panic. You can see how this kind of secondary reaction can cause a minor stress flare-up to turn into a major one. DAY 5 If you have experienced any of these more serious signs of stress in the last month write them down today. If your problems are of a less serious nature (be thankful for that) and just make note of any form of stress you experience today. Examples: Last Friday I was driving in the emergency lane to beat the traffic. Yesterday I told my customer a reconditioned product was brand new. This month I’ve been so depressed it’s been difficult getting out of bed. DAY 6 The week in review. Today you are going to make a list of the stress, stressors and stress symptoms you experienced this week. Stressors are sources of stress, stress is how you feel during the event and stress symptoms are what you feel later. After you complete this list, circle the stressors you believe you could control (by avoiding or eliminating) and see if you can’t sidestep these sources of stress next week. Share this list with someone you trust. Try to find at least one stressor on the list your friend isn’t bothered by. This will be the first clue to unraveling the mystery of managing stress. If it doesn’t bother him or her, why does it have to bother you? *Keep in mind, your symptoms may be the result of a condition that is not stress-related. For example, headaches can be caused by stress but can also be caused by other things like caffeine withdrawal. Once you’ve made a connection between your sources of stress and stress symptoms double-check with your doctor to see if he or she agrees with your opinion. DAY 7 The BIG picture. This week you looked for your most obvious causes of stress. We learned the difference between stressor, stress and stress symptoms. Our goal was to make you more aware of who or what is bugging you on a daily basis. Go back over the week and look for any patterns. You may find the name of one person (like a particular co-worker or client) that keeps popping up. Or you may find that one activity like waiting in lines, or driving in heavy traffic is causing you to feel stressed. Or you may find one time of day - like the morning rush - where you experience the most stress. If it’s one person - let’s say a client maybe you can hand that person off to someone else in your office. If it’s one activity, like waiting in lines, maybe there are times you can shop or do your banking when the lines aren’t so long. If it’s one time of day, like the morning rush, maybe you can get up a half an hour earlier, or get things ready (like bag lunches) the night before. In the box to the right we’ve included a short stress test. This is just an informal test designed to give you some perspective about how much stress you are experiencing in your life right now. How badly do I need this journal? Evaluate each statement and indicate how you feel about it by choosing a number from 1- 4. 1 = Strongly disagree 2 = Moderately disagree 3 = Moderately agree 4 = Strongly agree 1. I often feel disorganized. 2. I am often late for appointments. 3. I get headaches twice a week. 4. I get 4 or more colds a year. 5. I take over-the-counter medications two times a week or more. 8. My life feels out of control. 9. I often drink an alcoholic beverage to calm me down after work. 10. I’m too busy to exercise on a regular basis. 6. I lose my temper easily. 7. I suffer from insomnia. Total Score____ If your total score is between 10-15 use the journal for fine tuning; 15-25 there are some areas you need to work on (notice any statements you strongly agreed with. This is an area that needs work); 25-35 you need to pay close attention to the techniques offered in this journal. 35-40 keep using the journal and retaking the test until you lower your score by at least 10 points. 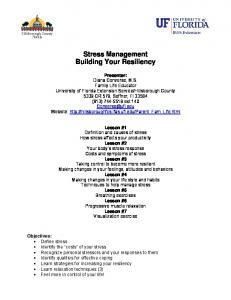 Report "The Stress Management Journal"